Dar Es Salaam –This month IOM, the UN Migration Agency, assisted in the voluntary return of 300 Ethiopian migrants (6 women and 294 men, among them 191 children and 36 medical cases) stranded in Tanzania. The migrants left Tanzania on four different flights in the month of June, with the last group of 84 migrants departed on Tuesday (19/06). The return was made possible through the Better Migration Management (BMM) programme: a regional, multi-year, multi-partner programme co-funded by the European Union (EU) Emergency Trust Fund for Africa and the German Federal Ministry for Economic Cooperation and Development (BMZ). Prior to the voluntary return IOM, in collaboration with officials from the Federal Government of Ethiopia and the United Republic of Tanzania, carried out a three-week-long identity verification mission in various detention facilities across Tanzania. As a result, 300 irregular migrants identified as vulnerable due to their medical needs, gender and age expressed the desire to return back home. Upon the completion of exit formalities for these migrants, Ethiopian immigration officials issued them with travel documents while the Government of Tanzania granted amnesty from detention for unlawful presence in the country. In line with IOM’s voluntary return procedures all migrants underwent a medical fit-to-travel examination. 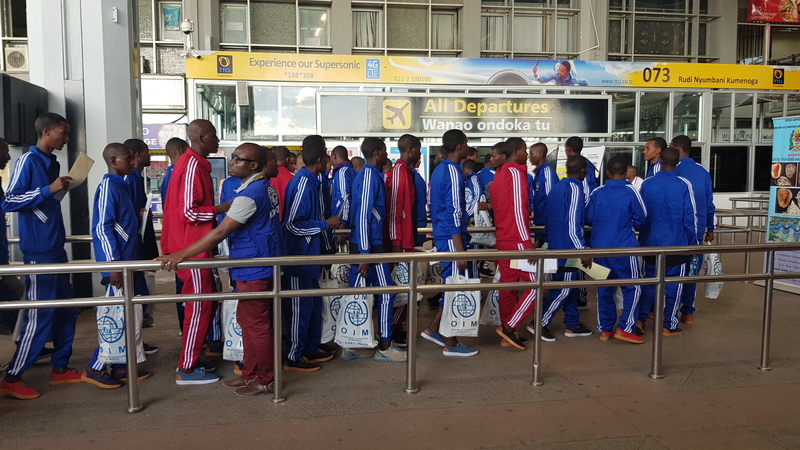 They were also provided with non-food items including new clothes and toiletries, and given departure assistance at the Julius Nyerere International Airport in Dar Es Salaam. IOM staff in Ethiopia welcomed the migrants upon their arrival in Addis Ababa, providing them with post-arrival assistance which included psycho-social support, medical care, and orientation sessions. This was funded under the EU-IOM Joint Initiative for Migrant Protection and Reintegration in the East and Horn of Africa programme. Qasim Sufi, IOM Chief of Mission in Tanzania, expressed his appreciation to the Governments of Tanzania and Ethiopia for the excellent collaboration that has enabled the smooth return of the migrants back to their home country. "I wish to thank the donors for their continued support to the Government on this increasing migration phenomenon in the country,” remarked Anna Makakala, the Tanzanian Commissioner General of Immigration Service (CGI). She added that a meeting between the origin, transit and destinations countries is fundamental in mitigating these challenges as well as charting a way forward through cross border cooperation and collaboration. Julia Hartlieb, the Senior Regional Programme Coordinator for the Better Migration Management programme and the EU-IOM Joint Initiative expressed her appreciation for the collaboration between the Governments of Tanzania and Ethiopia in providing support the vulnerable migrants. She said the returnees will receive individualized reintegration assistance in Ethiopia based on their identified vulnerabilities, which will facilitate their reintegration into their communities of return. In Ethiopia each returnee will undergo an interview to determine their specific reintegration needs that can range from individualized, collective and community reintegration assistance geared towards supporting the returnees’ economic, social and psychosocial needs under the EU-IOM Joint Initiative project. The programmes, The Better Migration Management (BMM) and the EU-IOM Joint Initiative Programme are programmes funded by the EU Emergency Trust Fund and aim to support countries falling under the Khartoum Process. The programmes focus on ensuring not only the dignified and orderly return of vulnerable and stranded migrants to the Horn of Africa countries, but also to contribute to sustainable reintegration.